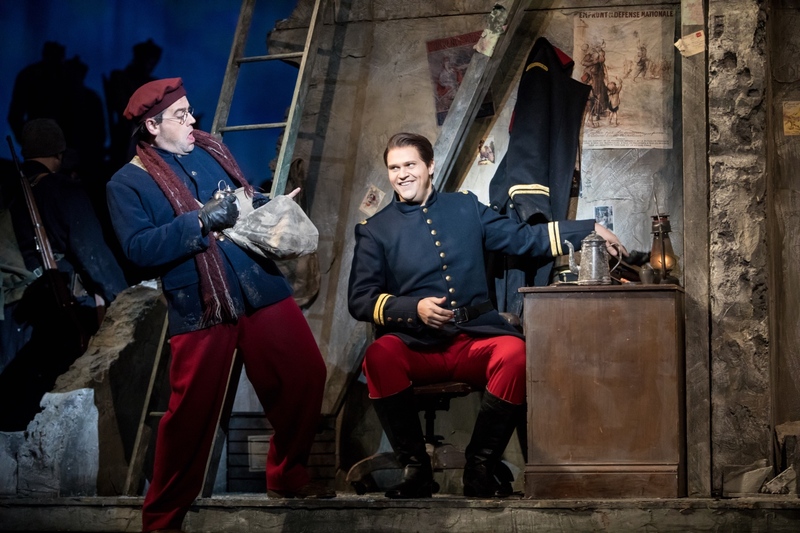 Miles Mykkanen as Nikolaus Sprink in Silent Night, Minnesota Opera, 2018. Photo: Dan Norman. 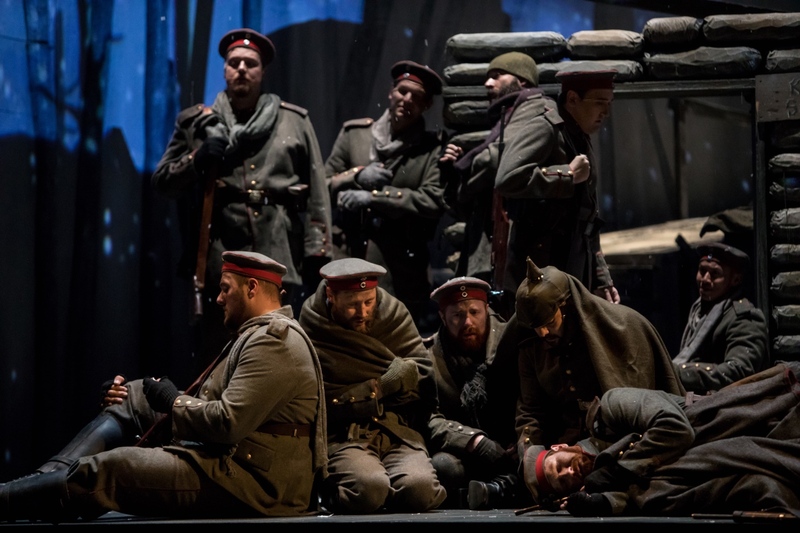 In 2011 Silent Night by composer Kevin Puts and librettist Mark Campbell debuted at Minnesota OPera. In 2012 it won the Pulitzer Prize fin Music. It is based on the film Joyeux Noël about the Christmas truce in 1914 (which was just the beginning of the war). It is sung in five different languages (French, English, German, Latin and Italian). And this November, the opera is being revived once again in the Twin Cities. Christian Sanders as Jonathan Dale and Troy Cook as Father Palmer in Silent Night, Minnesota Opera, 2018. Photo: Dan Norman. I was a little apprehensive on how a combat story would transfer to the opera stage. But I was surprised, from the minute the curtain went up at the Ordway Center for the Performing Arts - I was transported. The first scene begins in an Berlin opera house and seamlessly moves to a Scottish church, a home in France, and then to a raging bloody battlefield. 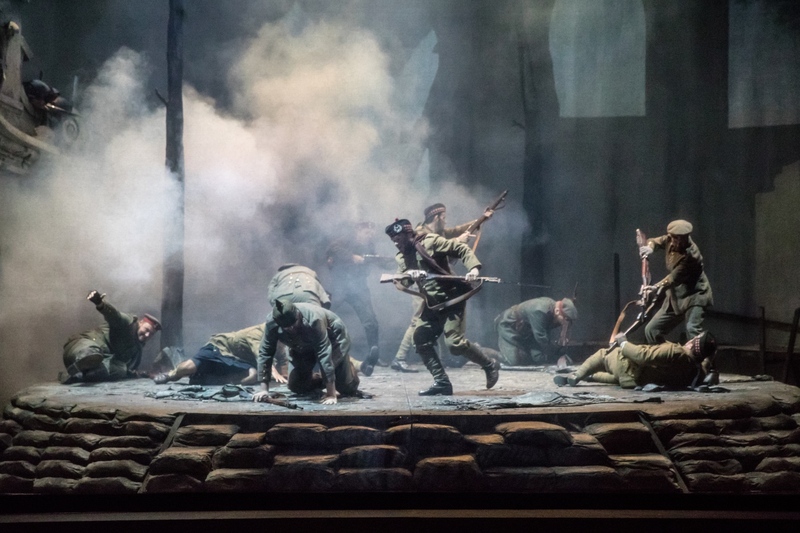 It was nerve-wracking to see so many set pieces rotating (for the majority of the opera the space between the trenches was represented by an elevated platform that rotated according to the drama), but everything went very smoothly. 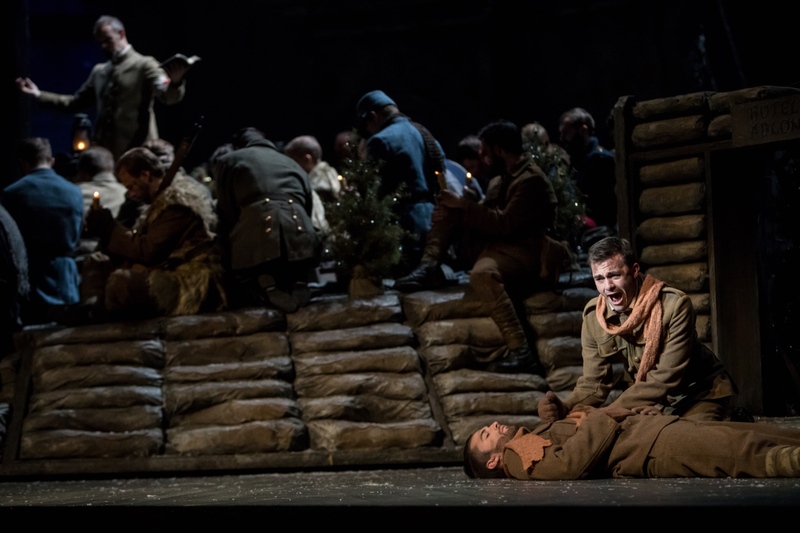 Christian Sanders as Jonathan Dale and Charles Eaton as William Dale in Silent Night, Minnesota Opera, 2018. Photo: Dan Norman. Scenic designer Francis O’Connor and production designer Andrzej Goulding certainly went above and beyond in this production. There was a lengthy battle scene that showed the savagness of trench warfare that involved too many actors to count, kudos to fight choreographer Doug Scholz-Carlson. 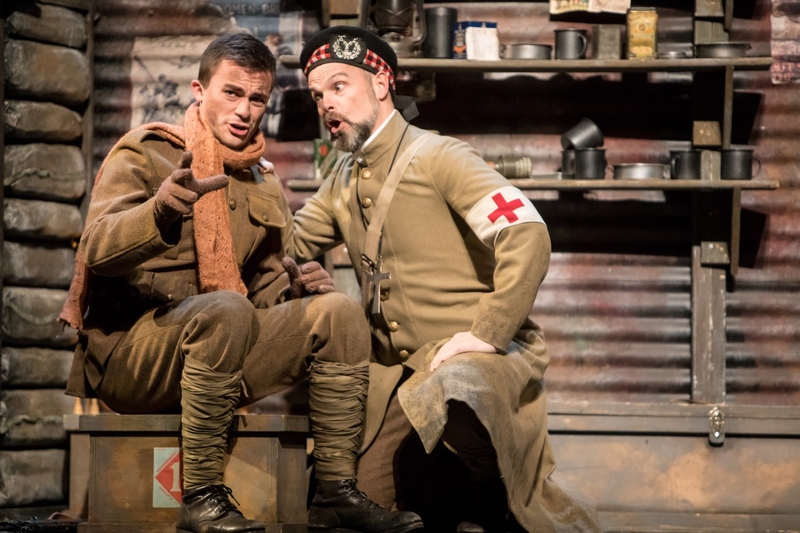 Andrew Wilkowske as Ponchel and Edward Parks as Lt. Audebert in Silent Night, Minnesota Opera, 2018. Photo: Dan Norman. As for the singing, Karen Wolverton as opera singer Anna Sørenson was phenomenal (Ms. Wolverton originated the role in 2011). Her voice sounded so sparkly and full in this role, it shows the music and character have had seven years to really sink into her instrument. Her spot-on acting revealed quite a lot about Anna even though she did not have the most stage time. Her lover Sprink (also an opera singer), emotionally sung by Miles Mykkanen, is the soldier who starts the whole truce with his wonderful singing and a tiny Christmas tree. The Minnesota Opera Chorus in Silent Night, Minnesota Opera, 2018. Photo: Dan Norman. The standout of the three Lieutenants was the German Lieutenant Horstmayer, sung by Joshua Jeremiah. More and more details about his character were expertly revealed throughout the story (garnering the most laughs of the night was Lt. Horstmayer’s angry exclamation, “This IS my first Christmas, I’m Jewish!”) Mr. Jeremiah was very solid vocally, but his character had to switch through three different languages and because of that, accents and consonants got a little confused. But this is quite an unusual task that is not asked of by singers within one opera, so I am sure that it will improve. Edward Parks as the French Lt. Audebert gave a glimpse of a decent family man being torn by war. Tensions between his father General Audebert (Wm. Clay Thompson were palpable. The Scottish Lt. Gordon (Christian Thurston) gave a stalwart performance. 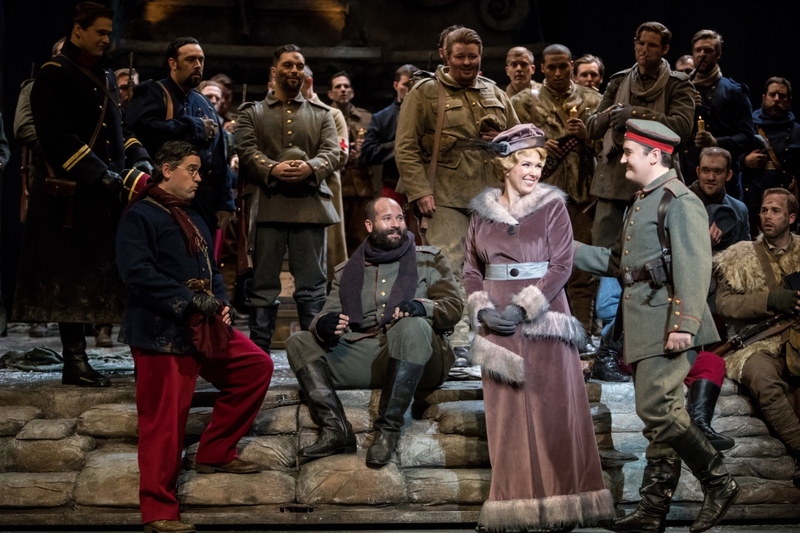 Andrew Wilkowske as Ponchel, Karin Wolverton as Anna Sørensen, and Miles Mykkanen as Nikolaus Sprink in Silent Night, Minnesota Opera, 2018. Photo: Dan Norman. Two privates left their mark as well. Christian Sanders, seen in last month’s La Rondine, gave a chilling performance of a reluctant soldier who progresses to a cold-blooded killer. Andrew Wilkowske as Ponchel was the comic relief, and the eventual tragedy, throughout the opera. What is most remarkable about this opera, is how it really transfers the movie effectively to the stage (which is often proved problematic with some other operas that I won’t mention). I really felt like I was watching the movie. Many of the memorable scenes were recreated very accurately. Minnesota Opera has proved once again their extraordinary talent at bringing new operas to life. Am I allowed to hate Silent Night? Wherefore art thou, opera?